Today i took the 70-669 exam to become Windows Server 2008 R2 Desktop Configuration Technology Specialist, it was a little hard in some areas cause some of the questions was on MED-V that i have not so much experience in, but APP-V and Presentation virtualization was a bit easier. As always with the exams, read the question thoroughly and think about what they want and then look at the answers. On tuesday i took the 70-693 PRO exam. 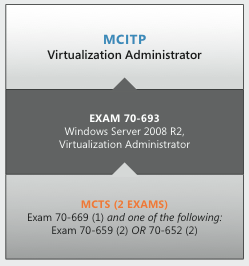 and last year i took the 70-659 so now i am MCITP: Virtualization Administrator. I have worked quite a lot with Hyper-V and System Center products and to study for the Desktop Virtualization i found this page and also used a free ebook to read, there are lots of free information on the internet and also some courses. The post that i wrote about earlier this month about the Microsoft Jumpstart videos also gives good information. i have been teaching this 10215A on Addskills that is the course for Implementing and Managing server virtualization and i can recommend it for interested technicians that want to get to know the Microsoft virtualization technologies on server and presentation. The course 10324A for Implementing and managing Desktop virtualization is quite new and i have not looked at it yet and as far as i know, no course centers offer it as of today at least not in Sweden. I found a blog post about the 5Nine Manager for Hyper-V, the cool part about this tool is that it can be run on the Server Core installation and provide a GUI for management of the Hyper-V role and the virtual machines. If for example your host has problems and has network connectivity issues this tool can be handy and use to for example check the eventlog on the core server. It is developed on the Hyper-V public API´s and coded in .Net. 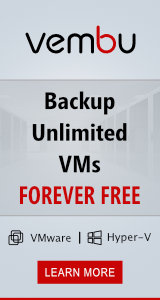 The best part is that it is free, there is a 99 $ licensed edition where you also in Core can access the virtual machines console and configure hyper-v networking, but the free version is enough when in troubleshooting a failing host. Hyper-V Management – 5nine Manager for Hyper-V allows managing virtual machines, virtual hard disks and networks on both local and remote Hyper-V servers. Use 5nine Manager for Hyper-V to manage Hyper-V on Windows 2008 R2 core and Hyper-V Sever installations without resorting to remote management via the Microsoft Hyper-V Manager or Virtual Machine Manager Server. 5nine Manager for Hyper-V can also be used to administer Hyper-V R2 hosts joined to a domain that is managed by a guest operating system, thus overcoming cyclic dependency issues. Network Management – 5nine Manager for Hyper-V provides comprehensive virtual network management as well as the management of virtual connections and bindings. Use 5nine Manager for Hyper-V to troubleshoot and fix network connections and related problems that cannot be fixed via remote management. 5nine Manager for Hyper-V Virtual Network Manager also allows reviewing and editing virtual network ports used by the virtual network interfaces and guests. Secure your Hyper-V Hosts – 5nine Manager for Hyper-V does not extend a potential attack surface on managed Hyper-V servers and does not install or require any additional components. Maximize Host Performance – 5nine Manager for Hyper-V has a small memory footprint and does not consume any resources on managed Hyper-V servers when it is not running. Follow Best Practices – 5nine Manager for Hyper-V is a valuable tool for managing the virtualization stack on production environments that are utilizing Windows 2008 R2 Server core installations according to Microsoft Best Practices as well as the Microsoft Hyper-V Server 2008 R2. Today i have been helping a customer with their Hyper-V R2 Cluster and patching it with the hotfix for westmere processor. one strange issue was that we found two of the blades reporting only 36 GB RAM, while the others correctly showed 72 GB RAM. As it was another consultant that was responsible for assembling the servers we first thought that they had missed to put in all DIMMs, when we loooked in the servers all slots where filled? And when we put it back in the chassi and powered on the server correctly showed 72 GB RAM! really strange. On Technet Edge there is a couple of videos for Virtualization admins to learn more about how Microsoft Virtualization solution works. It is a very good way to get up to speed what Microsoft has to offer and that it is a competitive solution! The “Microsoft Virtualization for VMware Professionals” Jump Start is specially tailored for VMware and Microsoft virtualization technology pros. This cutting-edge course features expert instruction and real-world demonstrations of Hyper-V, many components of the System Center Suite, including VMM 2012, and a myriad of VDI solutions. This course is designed for Data Center Managers, IT Professionals, IT Decision Makers, Network Administrators, Storage/Infrastructure Administrators & Architects. Expert IT infrastructure consultant, Corey Hynes, and Microsoft Technical Evangelist, Symon Perriman, leveraged an engaging “team teaching” approach which makes the class as entertaining as it is educational. You create a virtual machine on the CSV on a cluster node. You start the virtual machine on the cluster node. You move the CSV owner to another cluster node, and you change the state of CSV to redirected access. The cable for local area network (LAN) is disconnected. The related network adapter is disabled. The connection is switched by using Failover Cluster Manager. Not all “0x0000007a” Stop error messages are caused by this issue. You may also receive other Stop error messages when this issue occurs. For example, you may receive a “0x0000004F” Stop error message. $VM = Get-VM -Name "VMc2test"
and why did i select the ones that had SCSI in the remove part, well the system vhd where the OS resides is on the IDE controller so i can safely assume that the OS will still be accessible, as some of you already know in Hyper-V the boot volume must reside on a IDE controller for the VM to boot.